The Institute for Housing and Urban Development Studies (IHS) is an international centre of excellence of the School of Economics (ESE) and the Faculty of Social Sciences (FSS) of the Erasmus University in Rotterdam, the Netherlands, operating on a global scale by offering post-graduate education, training, advisory services and applied research. Cities cannot be understood as autonomous entities nowadays, as complex processes on local, regional and global scales affect them. 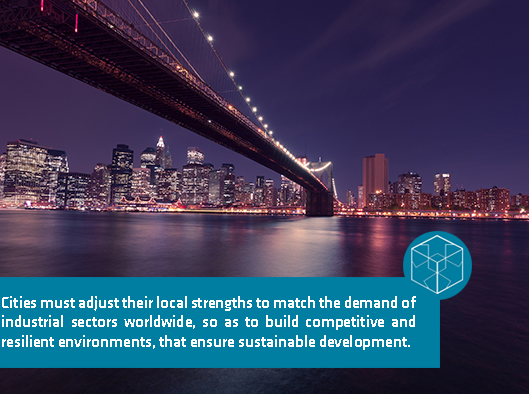 In order to understand better these processes, it is important to consider the qualities of the city that influence its performance at the local and regional levels, as well as its position in global economic network. One of the six thematic areas at IHS is Urban Competitiveness and Resilience (UCR), developed by Ronald Wall, economic geographer and urban planner. UCR investigates the relationship between globalization processes, local economic development, and urban conditions facilitating the ability of cities to successfully compete or collaborate with other cities on various scales. Given the increasing dependency of cities on global economic networks, it is crucial to find the balance between social wellbeing, local economic development and global strategies that can ensure resilience to socioeconomic shocks and fluctuations. Aside from educational activities, UCR is also involved in applied research and advisory projects. For details on our external activities, please refer to the research projects, publications and news segments of our page. The Urban Competitiveness and Resilience specialization is part of the IHS Master’s programme on Urban Management and Development.